We tried to go to Ken’s Artisan Pizza for lunch only to find out we were at Ken’s Bakery instead. 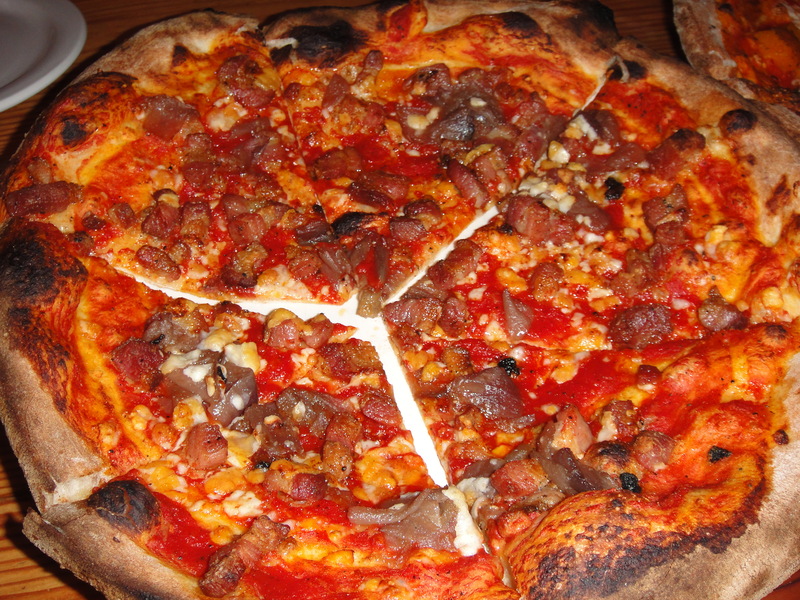 We headed over to Ken’s Artisan Pizza only to find out they are only open for dinner from 5 to 10 PM. Since Matt wanted to watch the Raven’s game at 5:15, we watched the game at Henry’s and headed over to Ken’s after that. Somewhere in between was when Boyfriend lost his cell phone and we waited and waited for a table. My friend Kitty had warned me to go early otherwise we’d wait for a loooong time for a table. And wait we did! It was a blessing though because I was so full from our earlier escapades that it gave my stomach a chance to want food again. We ordered three pizzas for the four of us and had a couple slices leftover. Matt asked where the pepperoni was on the menu. 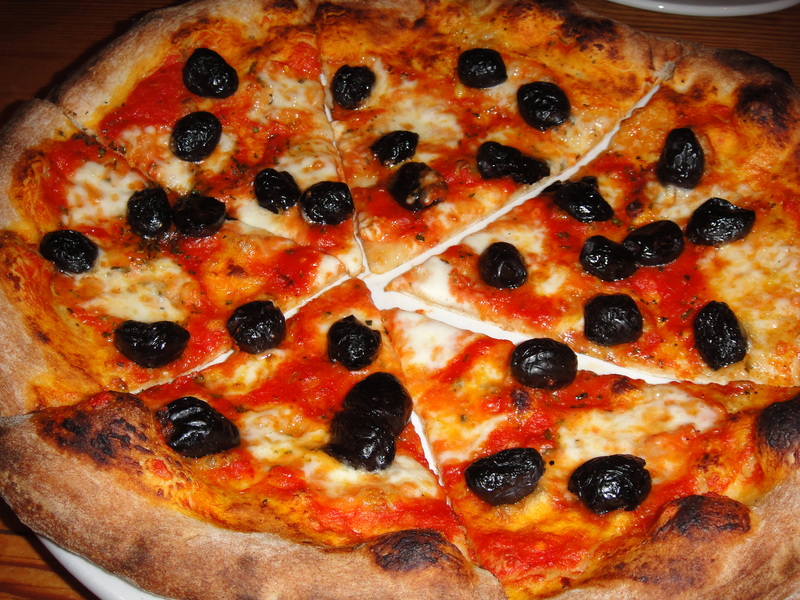 ; ) We ordered an olive pizza, an Amatriciana – roasted tomato sauce, housemade pancetta, red onions and Pecorino, and a butternut squash with basil pizza. 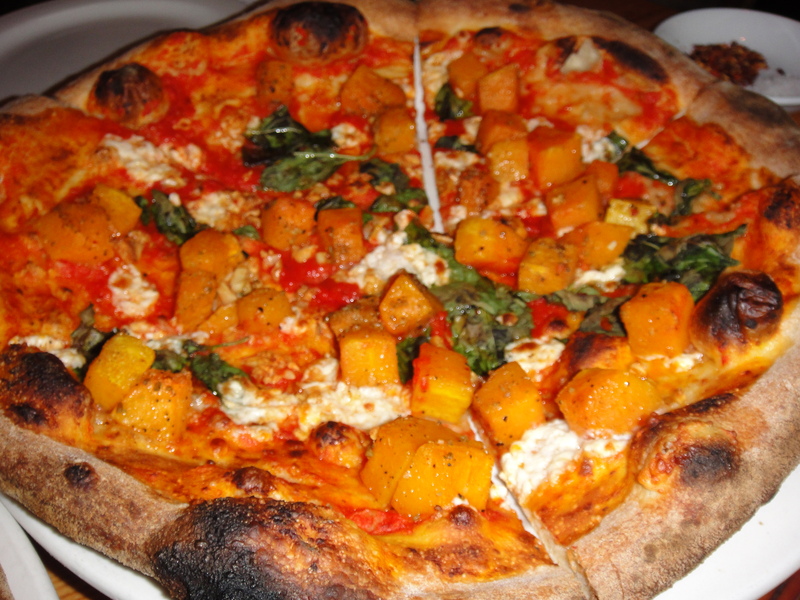 They were all excellent but I liked the butternut squash one the best. Great thin crust pizza but make sure to go early otherwise you’ll end up waiting an hour like we did. I think we finally ate around 9:30 PM!! Ummm, did I mention we also ate cupcakes this day?!? 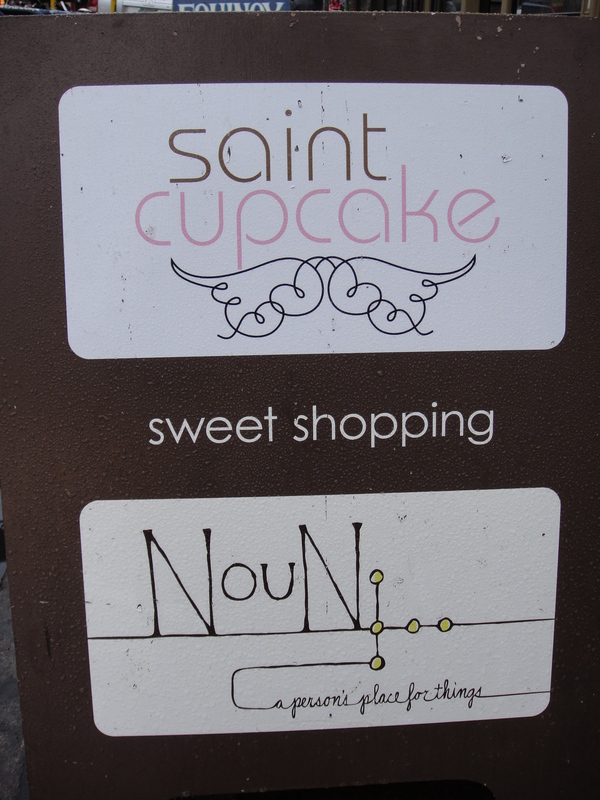 Saint Cupcake on Belmont was a quaint little place. You feel like you stepped into someone’s house with a bunch of antiques and cupcakes are sold in the back. So cute! I got a hot fudge with vanilla cake and Boyfriend got the peanut butter / chocolate cupcake. Elisa and Matt got red velvet and said it was the best of them all. They probably weren’t the best cupcakes I’ve had but I loved the store they were sold in! The cake was a little on the dry side but I loved the frosting to cake ratio. Other places have too much frosting. We did have one negative experience here. We parked at Zupan’s across the street and did a little shopping. When we came out, there was a young couple who asked us for money because they needed gas. We quickly put our head down, mumbled an apology and walked across the street. 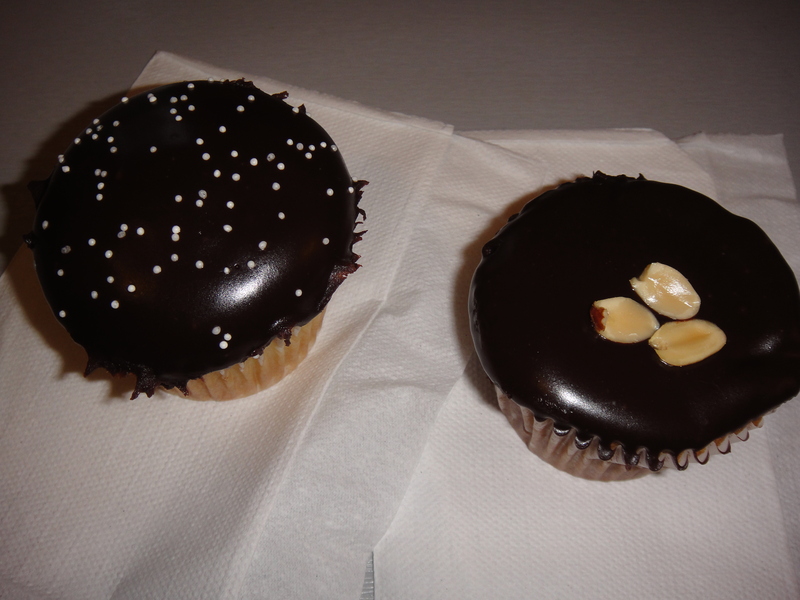 The whole time we were in Saint Cupcake, Elisa felt guilty for not giving them money. The couple moved and stood right outside of Saint Cupcake so Matt mentally decided to give them a couple bucks. As we were shopping in the store, we noticed the couple had come inside. The girl walked out right in front of us carrying a big pink box from Saint Cupcake!!! When we walked out, the couple were a few steps away but the girl deliberately turned and came back to ask us for money again!! All while holding her box of cupcakes!! How can she look us in the eye and ask us for gas money while holding a box of cupcakes she had just bought?!? Unbelievable. 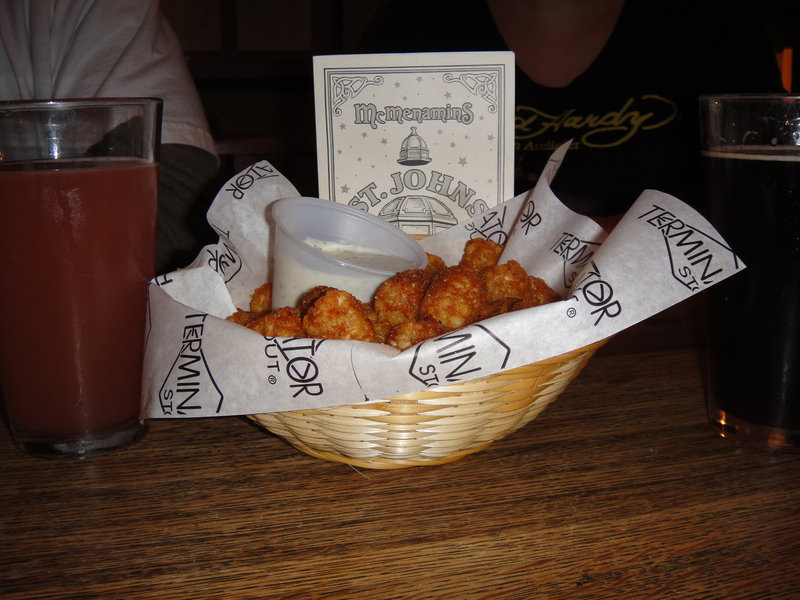 Would you believe that after our “lunner” at Bridgeport, we moseyed on over to Henry’s Tavern to watch the Ravens game? 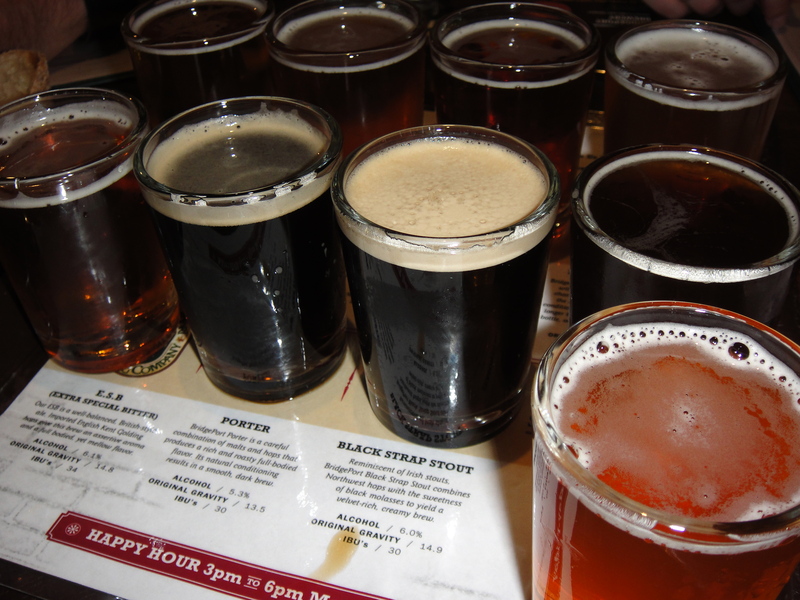 They have over 100 beers and hard ciders on tap with the majority of them hailing from local breweries. 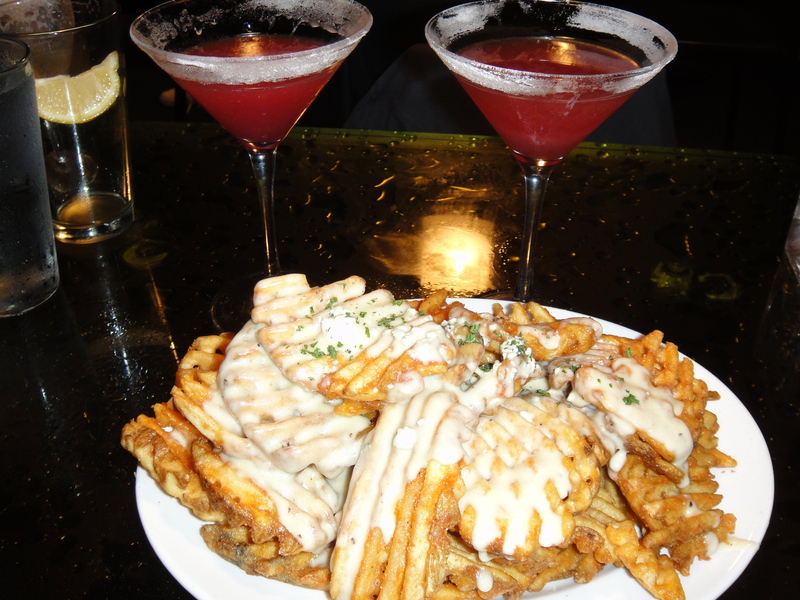 Even though we weren’t hungry, it’s a rough drinking without something to munch on so Boyfriend ordered waffle fries with gorgonzola cheese melted over it. I’m not usually a fan of gorgonzola but when it’s melted, it’s much milder. And of course, it was smothered on top of french fries which I love. Matt bought Elisa and I Moroccan coffees and the pomegranate and raspberry martinis pictured above so I didn’t even try the beer there! We weren’t able to find four seats at the bar but Elisa and Matt pointed out to us that there is ice all around the bar to set your drinks on so they don’t get cold *edit* warm. Genius!! For whatever reason, we got a late start on Saturday morning and by the time we sat down to eat at Bridgeport Ale House, we were ravenous. 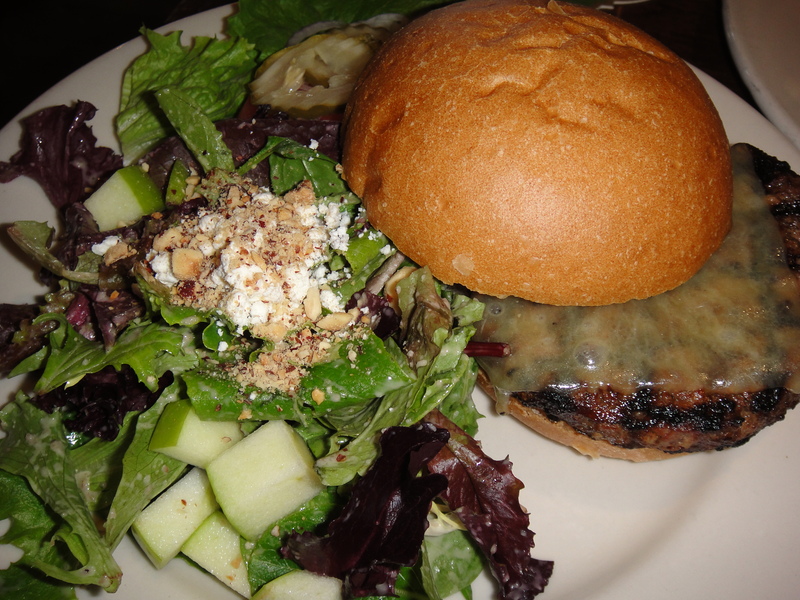 It was almost a “lunner” by the time we ate because it was past prime lunchtime. We started out with a beer sampler. Can you tell which one is the stout? I actually didn’t have a clear favorite out of these. 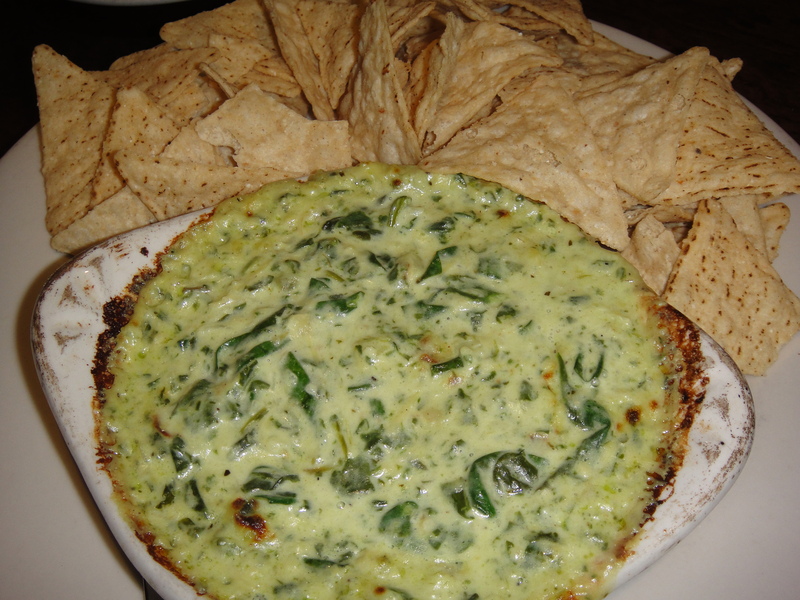 We needed to order an appetizer because we were so hungry and went with the spinach artichoke dip. It’s always one of my faves on the menu and this one did not disappoint! 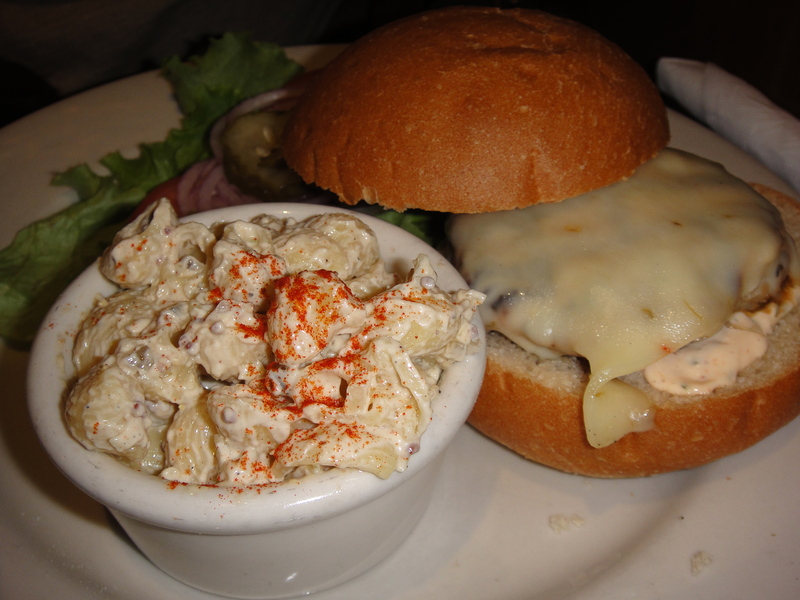 Elisa ordered the chicken sandwich with mac salad on the side. Boyfriend and Matt both ordered a burger. Boyfriend upgraded his side salad to the Bridgeport one which had cheese and apples in it. 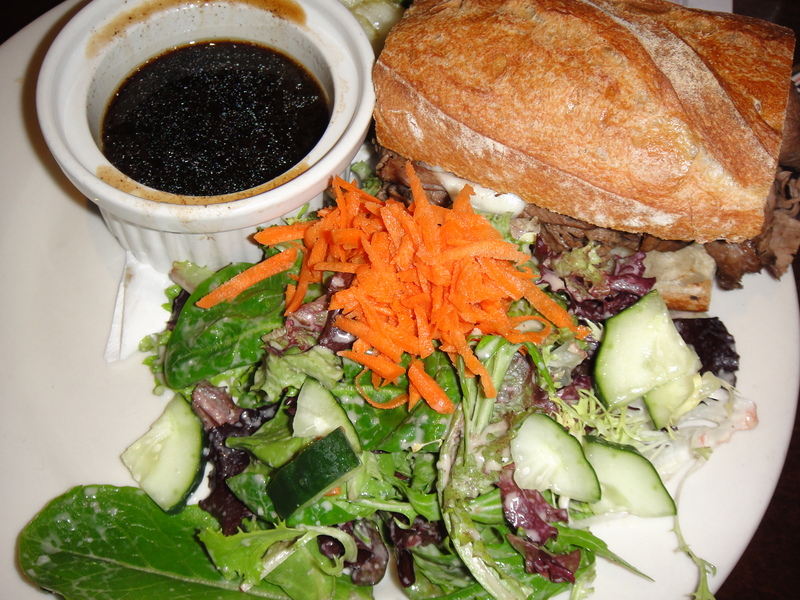 I went with the french dip with provolone cheese and a side salad in my attempt to be slightly healthy. The meat was thinly sliced and the au jus had great flavor. It started out innocently enough. Elisa and Matt asked if we wanted to grab a drink after they picked us up from the airport Friday night. We went to St. John’s Theater and Pub which is one of the McMenamins locations right around the corner from Elisa’s place. We sat right over the kitchen on the second floor and the heavenly aromas wafted up to us. It happened to be their late night happy hour and I happen to have this love for fried potatoes and that’s how I came to order the cajun tots. That entire basket of tots was $1!! It was slightly spicy tator tots with ranch to dip in. My ruby beer (which dangerously tasted like juice) is featured on the left and Boyfriend’s beer is on the right. And so began our weekend of over indulging. I know I just wrote in my last post that I’m trying to be healthier and lose weight but I was on vacation! Please. Don’t. Judge. In an effort to be healthier and hopefully lose some weight in the process, I have decided to reduce my red meat intake, cut down on starches as much as possible, consume more fish and hold off on the sweets. Boyfriend and I went to Bushi Tei in SF Japantown because we wanted to use our restaurant.com coupon and we were greatly surprised at how well everything was executed. 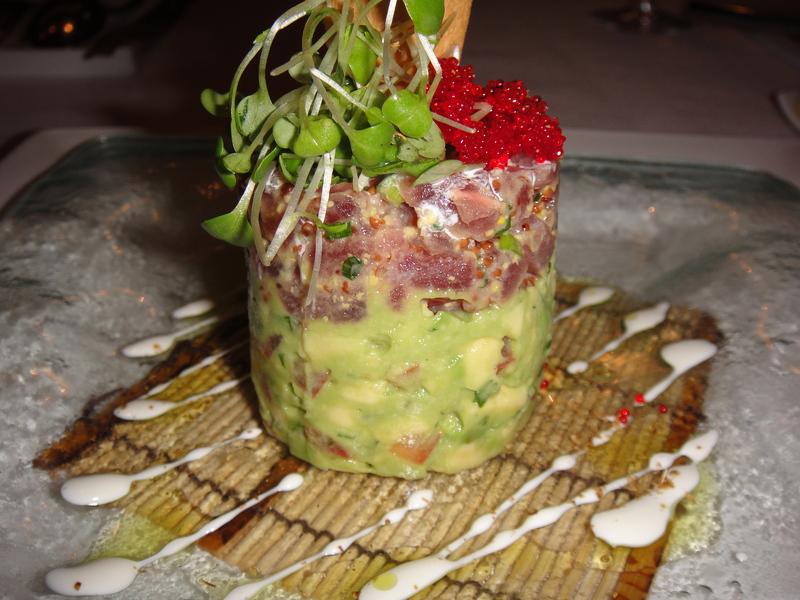 We started out with a tuna tartar over guacamole appetizer. Everything complemented each other well and the lime in the guacamole brought out some great flavors. 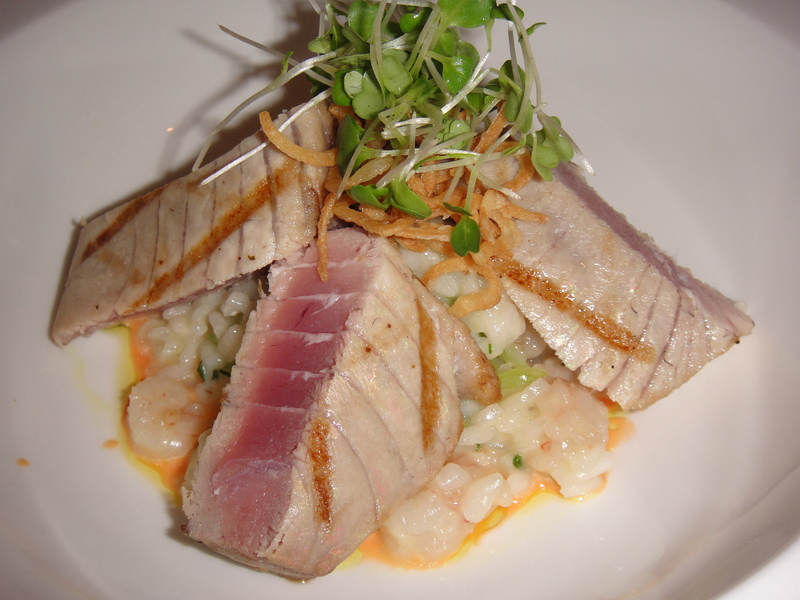 For my main dish, I went with the seared ahi tuna over rock shrimp risotto and red curry sauce. I was concerned about the red curry sauce at first but it was just enough to give a hint of it in each bite and was so yummy! Boyfriend has a special love affair with beef and although he ordered red meat for dinner, it was grass fed beef so he claims it’s okay. 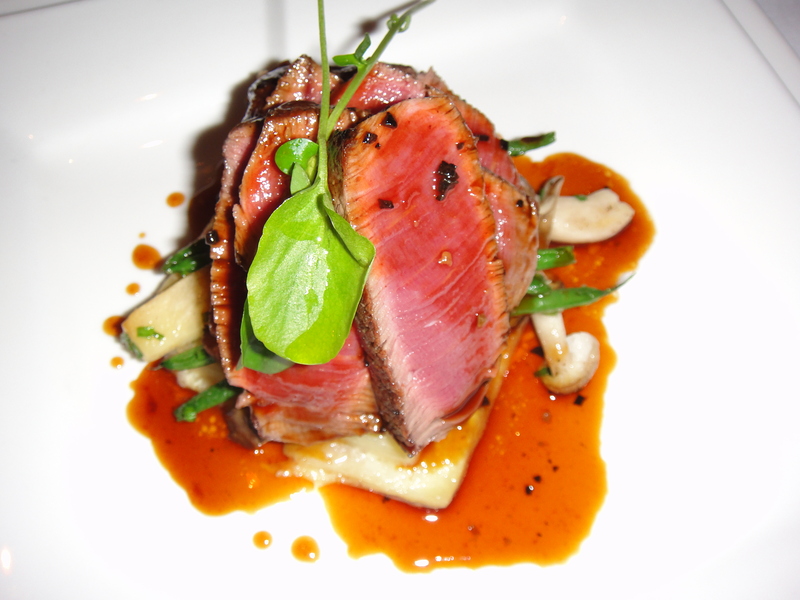 The meat was excellent and cooked to a perfect medium rare and served with mushrooms. 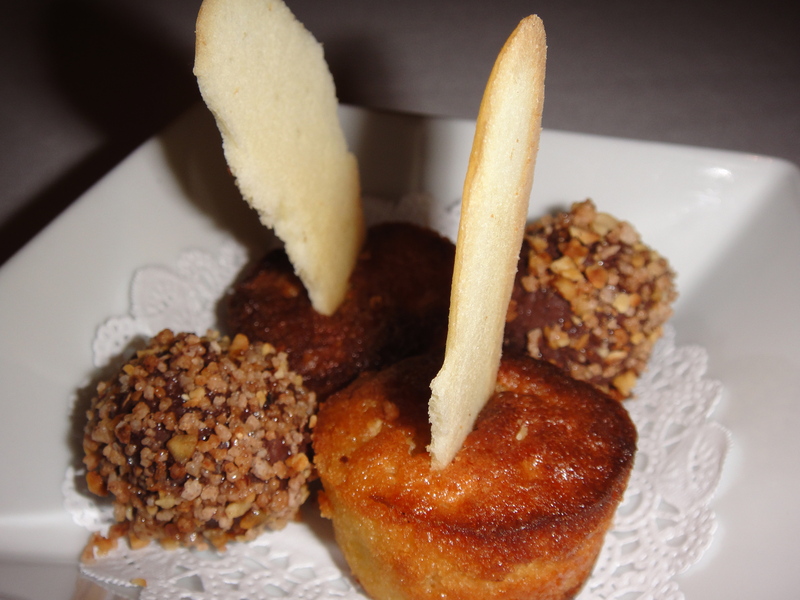 We did not order any sweets but they brought our these little almond cakes and chocolate truffles. It doesn’t count if we didn’t order it on our own, does it?!? 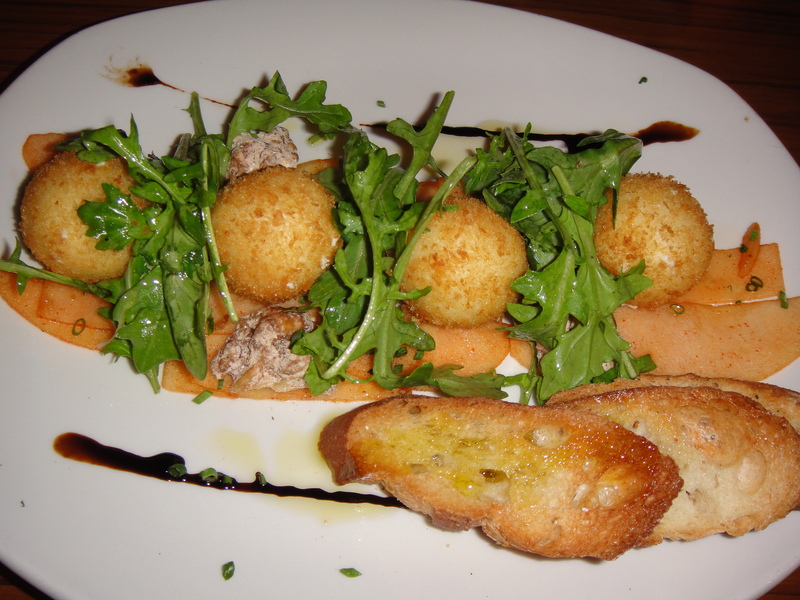 Matt’s high school friend is the chef at Cin Cin Wine Bar & Restaurant so Boyfriend and I had been dying to try it. We reserved a table and double dated with Elisa and Matt! 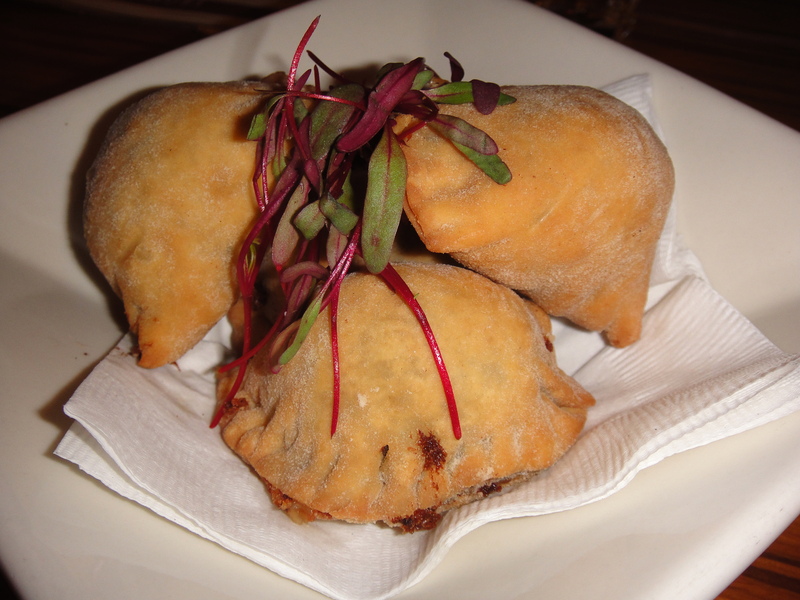 Right away, Matt’s friend sent over these truffle oil mushroom empanadas. I love mushrooms, Elisa does not. How we are best friends, I’m not so sure. They had so much flavor and had we not gotten these sent out to us, I would’ve wanted to order them off the menu. We ordered deviled eggs. 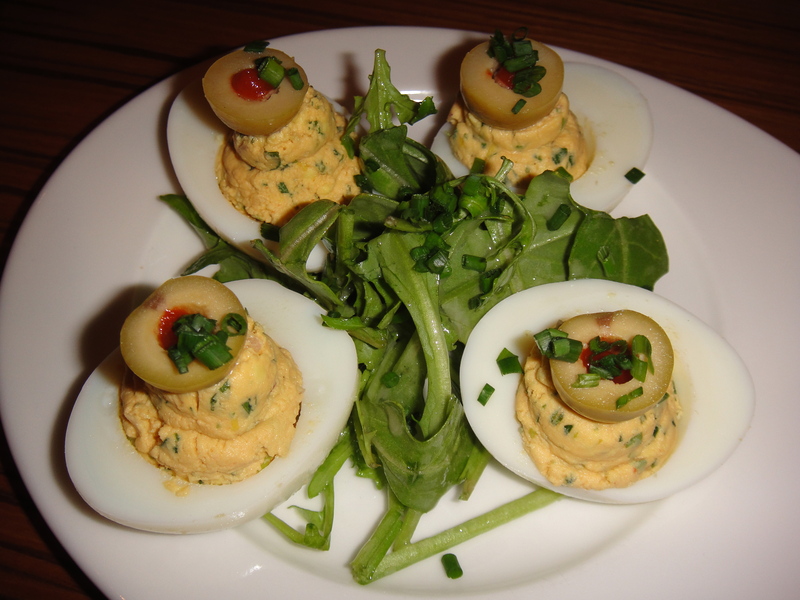 I’m usually not too big of a fan of deviled eggs but these were good with an olive on top! The salad in the middle was great too! Boyfriend doesn’t like seafood but he makes an exception when the seafood is FRIED. 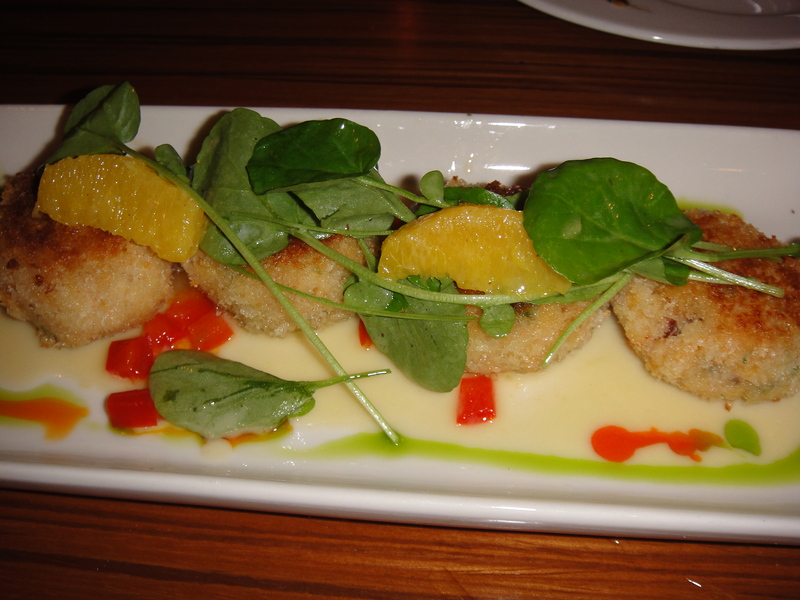 The crab cakes were excellent with crisy outsides and flaky meat in the middle. 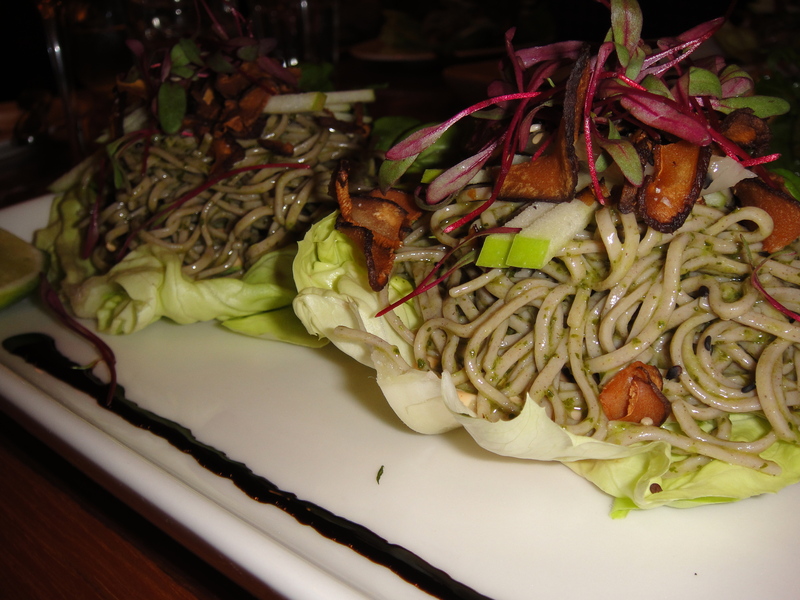 These soba salads were great and had so much flavor. I don’t know if I would’ve ordered this on my own because well, I’m Japanese and figure I can make soba noodles at home. Elisa and Matt chose this because they had eaten it before and we all loved it! The waitress told us to roll the lettuce leaf like a tortilla and just bite into it. All of this food plus a bottle of South African rosé wine and great company made this a wonderful evening. We went to Matt’s after dinner and played Wii Mario Bros. for a few hours. The first of many nights of that. It’s so addicting!! 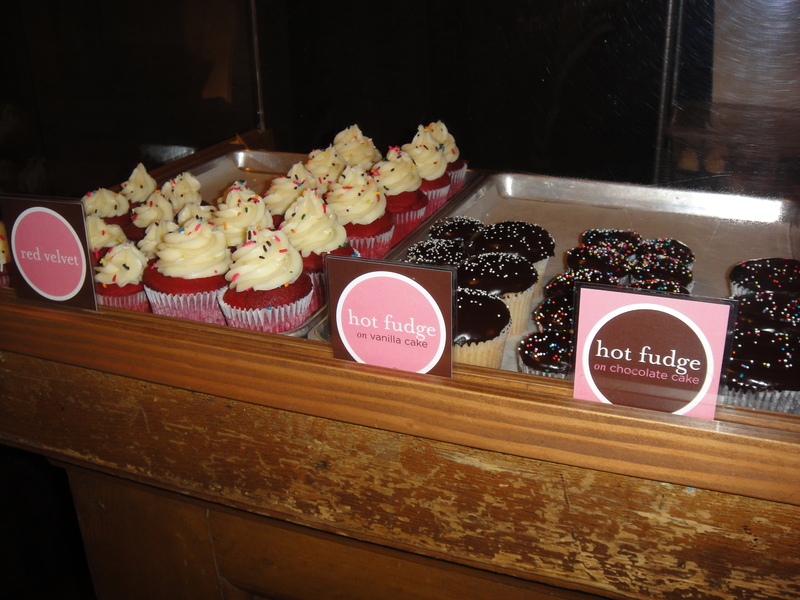 You are currently browsing the For the Love of Food weblog archives for January 2010.